Szombathely, the former Savaria, was founded in 43 A.D. by Claudius, the divine Roman emperor. Two archaeological excavations help us visualize the luxurious lifestyle of those times. Relics that can be seen in the Garden of Ruins include: the details of the largest mosaic of the Lieutenant-Governor's palace, the foundation walls of a 9th-century fortress built of Roman stones, an almost 50-metre section of the 2000 year-old Amber Road, and the shrine to Mercury. 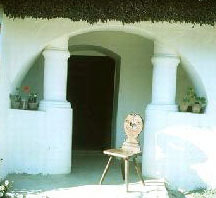 The pieces of the public bath and the customs house are kept in the Savaria Museum. The 2nd-century Isis shrine of the Iseum garden of ruins serve as background for the Iseum Summer Open-air Festival. The largest Baroque church in Hungary is the twin-towered Bishop's cathedral. The enormous interior is decorated with frescos, paintings and sculptures. The ceremonial hall of the Zopf-style bishop's palace is one of the best Baroque halls in the country. The Diocesan Museum is worth visiting for its lavish collection of ecclesiastic art. Its Library and Archive exhibits the paintings of Dorfmeister. Village Museum, Szombathely The Smidt Museum has an incredibly profuse collection of applied art, while the exhibitions of the Szombathely Gallery give you a taste of contemporary Hungarian art. Thirty seven buildings from 27 villages have been included in the Village Museum of Vas County. The nearby lakes are equally good for boating and fishing. The largest arboretum in Hungary, the K�mon Arboretum, has an enormous quantity of rhododendron bushes that blossom in May.